World Wonders 3 is the third level of this exciting new course incorporating National Geographic content. 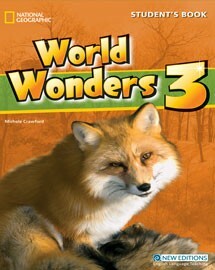 World Wonders 3 has been specially written for young learners in C Class. The student’s book is accompanied by an audio CD of reading texts, songs and the play. The Grammar book is available also as a Greek and an International Edition.